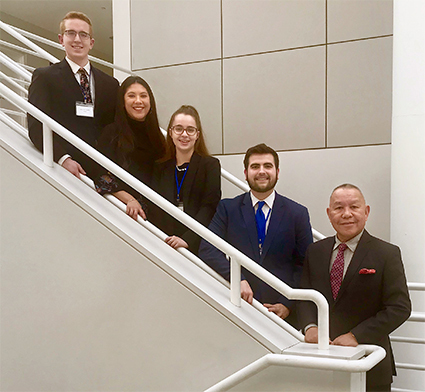 A group of four SUNY Potsdam business students advanced to the University at Buffalo Undergraduate Case Competition finals on Saturday, April 6 in Buffalo, N.Y. — one of only four teams from the original pool of 20 teams who entered the competition. After an impressive effort by two SUNY Potsdam business teams to claim a spot in the semifinals, one team’s presentation landed them in the finals where they placed fourth overall. The team of business students in the finals included Jason Perregaux, Illiana Wong, Claire Burns, and Austin Cronk. The other team of business students who placed in the top ten and who were invited to the semifinals included Bradley Sweet, Himani Shaker, McKenna Middlebrook, and Sierra Damon. “I am very proud of the eight business students who competed toe-to-toe with teams from top universities. They worked tirelessly to prepare, and spent hours, on top of their regular course obligations, to develop their strategic analysis and come up with a 20-minute presentation,” said Dr. Edwin Portugal who served as faculty advisor. “The intensive academic preparation of our students and their pure desire to do well was evident,” Portugal added. From the initial pool of 20 teams (80 students) who entered the competition, ten undergraduate teams from around the country were invited to Buffalo to compete for a chance to win a top prize of $5,000 for the best team analysis of a real-world business scenario. The four top teams from the semifinal round, including one team from SUNY Potsdam, advanced to the finals held later that day. The SUNY Potsdam business students competed against the University of Rochester, the University at Binghamton team and the University at Buffalo during the final round. The team leader for the SUNY Potsdam finalists also commented on the positive group interaction. “The team dynamic and cohesiveness of the team simply worked! We made it to the final four and it was our first time at such a competitive level, I am extremely proud and would do it again in a heartbeat. This was a great way to make my senior year really count," said Wong. Leading up to the live event on April 6, students were tasked with presenting a written business analysis for a case study about an entrepreneur trying to enter the jewelry business. The case provided details about the viability of an entrepreneur looking to sell Chinese pearls in North America. That’s where the SUNY Potsdam business students stepped in. “We recommended five strategies including increasing the entrepreneur’s global presence around the world by partnering with IBM, working with Mikimoto [a famous jeweler] and collaborating with Ama free divers, who have harvested sea shells, mollusks and oysters since 750 A.D.,” said Perregaux, one of the SUNY Potsdam students who advanced to the finals. To help them prepare for the live presentations on April 6, the eight business students pitched their business ideas to SUNY Potsdam faculty, staff and students during a “full-dress rehearsal” presentation at SUNY Potsdam’s Dunn Hall on Wednesday, April 3. "Dr. Bette Bergeron, provost and vice president for academic affairs, and Dr. Walter Conley, interim dean for the School of Education and Professional Studies, offered valuable perspectives for the students to think about when making presentations," said Professor Dr. Ed Portugal who is serving as the teams' faculty advisor. "They also offered words of encouragement that the students appreciated," he added. Graduate students in the M.S. in Management program also challenged the students with tough questions to simulate the judging in the competition. “Those questions by the graduate students in the Leadership in Organizations course, made the teams pause and think hard about how to answer difficult questioning by judges,” said Portugal. For more information about SUNY Potsdam’s Department of Business Administration, visit www.potsdam.edu/academics/SOEPS/BusinessAdmin.